I have now lingered at the window counter seating in Lammy's twice, finishing my meal and enjoying this moderately busy corner in Wakefield, as well as the comings and goings of its patrons. No matter how long you stay, there is a good chance that you will never be the only customer. Lammy's is an old neighborhood favorite that always has someone coming in hungry. It is also an important place for anyone with a flyer to distribute, as the basket near the front door attributes. Many sets of Jamaican and various Caribbean eyes walk through this door on a daily basis. When you see smoke coming out of an old oil barrel and pieces of jerked meat coming out fresh, it is safe to go ahead and order a meal of it. Otherwise it is hard to know when the meat was cooked and how fresh it will be. On a first visit, the safe road was taken with a heaping (small) order of stew chicken (above). Above a good portion of rice and peas, the excellent chicken can also be accompanied by some greens and as much gravy as requested. 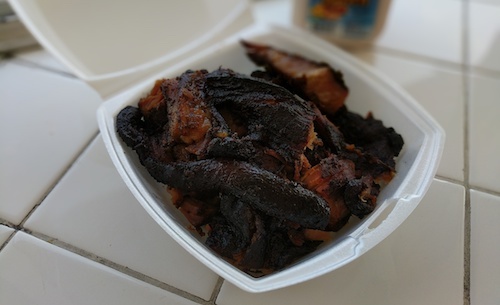 On a second visit and with the confirmation that the first meal was so good, a bit of a risk was taken with an order of jerk pork (below). The meaty bits were quite dry while the fatty pieces offered more moisture. After a couple bites I returned back to the counter to get a few scoops of the oxtail gravy, which made everything balance perfectly. In regular Caribbean steamtable fashion, before setting your heart on something, ask what is available on the day and pick from the choices offered. 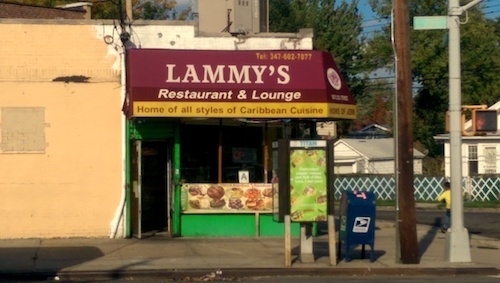 Lammy's advertises a lounge, and if you use the restrooms you must walk through this space to get there. It is unclear when the lounge opens though, and if they sell alcohol it was not visible from the small main room where people order. Maybe it is available for wedding receptions?